The first reasonably accurate portrayal of a part of the Newfoundland interior appeared on James Cook's 1770 "General Chart of the Island of Newfoundland". His knowledge of the Humber River as far as Deer Lake came from actual experience; the information which allowed him to outline the river systems between St. George's Bay and Grand Lake came from Mi'kmaq in St. George's Bay. On the other side of the island, several attempts were made to establish contact with the Beothuk by venturing inland. 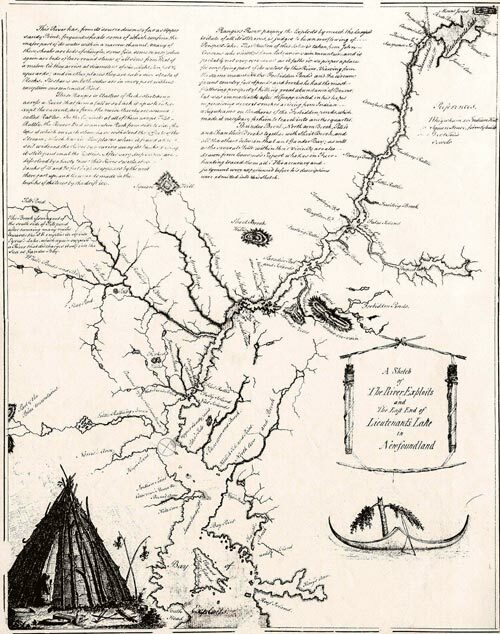 In 1768 Lieutenant John Cartwright explored the Exploits River as far as Red Indian Lake (which he called Lieutenant's Lake), which he mistakenly thought was connected to Grand Lake. However, his maps generally defined the Exploits water system for the first time. This River has, from its source down so far as Upper Sandy Point, frequent shoals some of which confine the major part of its water within a narrow channel. Many of these shoals are beds of shingle, some fine, some coarse, others again are beds of loose round stones of all sizes from that of a melon til they arrive at diameters of six, eight, ten feet upwards; and in other places they are extensive strata of Rocks. Its shores on both sides are in every part without exception one continued Wood. Those Ranges or Clusters of Rocks stretching across a River that form a fall or so block it up as to interrupt the current, are from the noise thereby occasioned called Rattles. In the Exploits at all of them accept Flat Rattle, the Rivers Bed is an entire Rock from side to side the tops of which on each shore have withstood the efforts of the Stream; which has in other places where it found a loose(?) soil widened the River by wearing away its banks leaving it still pent (?) in at the Rattles. After very deep freeze are dissolved by a hasty thaw this River swells above the banks of 15 and 20 feet high and appears by the wood there past up and the wounds made in the trunks of the trees by the drift ice. Rangers River passing the Exploits by much the largest tribute of all its streams, is judged to be an overflowing of Prospect Lake. The Situation of this Lake is taken from John Cousens who viewed it from Labour-in-vain mountain, and is probably not very erroneous as it falls in so proper a place for emptying part of its waters by this River. Viewing from the same mountain the Forbidden Ponds and the circumjacent country full of ponds and brooks he had the most flattering prospect of killing great abundance of Beaver: but was immediately after disappointed in his hopes on perceiving several smokes arising from Indian whigwhams on the shores of the Forbidden ponds, which made it necessary for him to travel into another quarter. Thunder Brook, North arm Brook, Peter's and Chandler's Brooks together with Shoot Brook, and all the others between that and Gander Bay; as well as the several Huts within their vicinity are also drawn from Cousens's Report who has in Furr hunting traced them all. His accuracy and judgment were experienced before his descriptions were admitted into this Sketch. Courtesy of the National Archives of Canada/NMC 27. Cartwright did not meet any Beothuk, and there were no further official expeditions until 1810, when Lieutenant David Buchan was commissioned by Governor Duckworth to explore the Exploits River and establish friendly relations with the Indians. Buchan also reached Red Indian Lake (January 1811), but retreated when two of his men were killed by the Beothuk. He travelled to the Lake once again in 1819-20, this time to return the body of Demasduit (Mary March). Buchan's maps were never published. 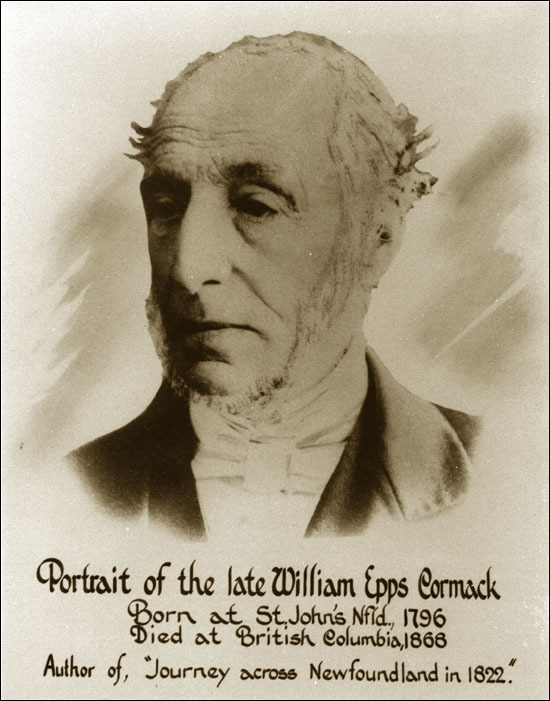 Also interested in establishing contact with the Beothuk was William Epps Cormack (1796-1868). Born in Newfoundland and educated in Scotland, Cormack decided to explore the interior. Guided by a Mi'kmaq, Joseph Sylvester, he set off from Smith Sound, Trinity Bay, on 5 September 1822, and reached St. George's Bay – exhausted – on 4 November. He failed to meet any Beothuk, but his expedition is now seen as one of the most important in the exploration history of Newfoundland. Courtesy of the Map Library, Memorial University of Newfoundland, St. John's, NL. So far as is known, Cormack was the first person of European descent to cross the island. Trained as a scientist, he made close observations of the flora and fauna, noted geological formations,	and recorded the information he obtained from the Mi'kmaq – for instance, their use of the interior, and their travel routes. Cormack's Narrative of a Journey across the Island of Newfoundland in 1822 was first published in the Edinburgh Philosophical Journal (1823-24) and later expanded into a book. 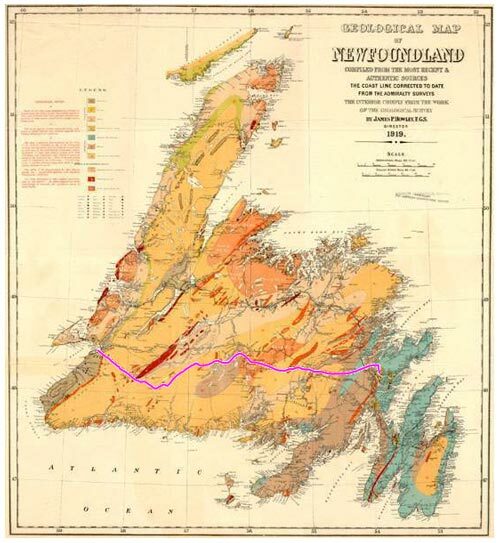 This work contained the first geological map of any part of Newfoundland, and the details of all he had seen and experienced. It has been called "the undisputed classic of Newfoundland travel." (Story 1976). For many years, the Narrative was one of very few sources of information about the interior, and therefore had considerable influence. Some of his place names survive – Mount Sylvester, Serpentine Lake, George IV Lake and Jameson's Hills. 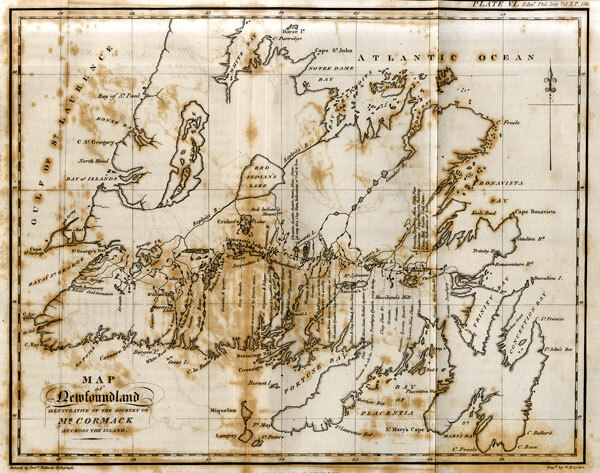 The map provided the first detailed information about the interior of the island of Newfoundland. From the Edinburgh Philosophical Journal, Vol X, No 19, January 1824. Courtesy of Kurt Korneski. Five years later, Cormack made a second journey to the interior, this time up the Exploits River, again seeking the Beothuk. His party explored the territory between the Bay of Exploits and White Bay, and the eastern end of Red Indian Lake. These journeys, as well as others of which we have no record, established the basic geography of the interior of the island of Newfoundland – for Europeans. It is clear, however, that the island's Mi'kmaq were intimately familiar with the interior long before Cormack. European knowledge of the interior was added to gradually over the rest of the 19th century, sometimes with the assistance of Mi'kmaq guides.